Yes, only two sleeps. OMG! I have made a packing list but need to pull out my cabin-legal backpack and start tossing things in. And as all yarnies know, the most important item in your suitcase is the knitting or crochet project. I am pretty sure I’ll be taking some cotton yarn and a hook or needles with which to make a really simple travel project. I will be mostly offline for a week so I’ll update you all after I get back. This trip is to celebrate our 30th wedding anniversary. We usually go on a small retreat within the province but we’re going further afield for this one. My only knitted WIP is this one – Lanesplitter skirt. I made one of these years ago with James C Brett Marble Chunky and I love it. So comfortable. Easy. Customisable for length, width and yarn gauge. This time I’m using the somewhat brighter Bernat Pop! in Full Spectrum. I am withholding my judgment on it until I see whether I dare to wear such a bright garment! It could always be adapted to be a cowl! Easy stitch pattern to memorise. With hindsight, it may have toned things down to stripe it with black. Hmmm! Today I’m not working until 5 so I spent a happy few hours in my sewing room. 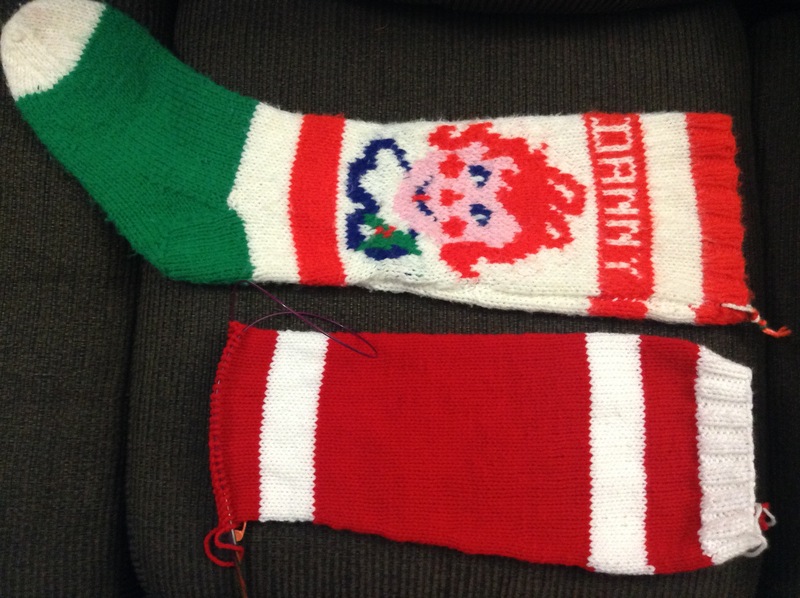 This year I decided to make some Christmas stockings. If I’d had more time, I would have crocheted them, but time was running out and so I bought flannelette at work in neutral shades and whipped up five of them, adding some white polar fleece around the top. The five of us are actually making wishlists this year and planning to give each other gifts. Two out of the three boys are working now. The other one is pretty broke after his recent holiday to California but I’m sure he can scrape something together and show willing! The foot looks huge from this angle and the cuff isn’t smooth in this photo, but there’s plenty of room for stocking stuffers. While I was downstairs, I pulled out some bandanas that I’d made a couple of years ago for the farmers market. They didn’t sell and have been sitting around since. I cut them into quarters and hemmed the raw edges, then pulled out another fabric from the drawer and made a few more from scratch. We’ve been using cloth napkins for years now. We never need to buy paper towels or napkins. Our old cloth ones are so well used now that they are falling apart so these new ones will get lots of use. It’s so grey today I went with kitchen photos with the overhead light on. Not perfect but you get the idea. And finally, I’m sure we’ll get a tree this year but not until dh and I are back from holiday. So for now we have a Lego City Advent Calendar that I couldn’t resist picking up from Costco a while back. It’s fun to have a teeny tiny model to make each day. We’re taking turns. How are your Christmas preparations going (if you celebrate it)? Do you have lots of gifts to make? Yay, it’s another FO (finished object). I posted this morning with a photo of my less-than-satisfactory snowman. Only one comment was received (from Eleonora of Coastal Crochet.com) but I was glad of the input. I agree with her that the hat looked too big, so I whipped it off the stocking and tossed it. I repositioned the scarf slightly, duplicate stitched an alternative hat, made a tiny pompom (just like I used to when I was a child, with two little cardboard circles) and added some stick arms. Tai Chi Man also thought the hat looked wrong but the scarf was okay, so that gave me the extra impetus I needed to change things. And he approved of the pompom hat too! Specs: Loops & Threads Impeccable in red hot, kelly green, orange crush, white and black. Size 8/5mm needles. I am surprised at how quickly I finished this. It took less than two weeks. 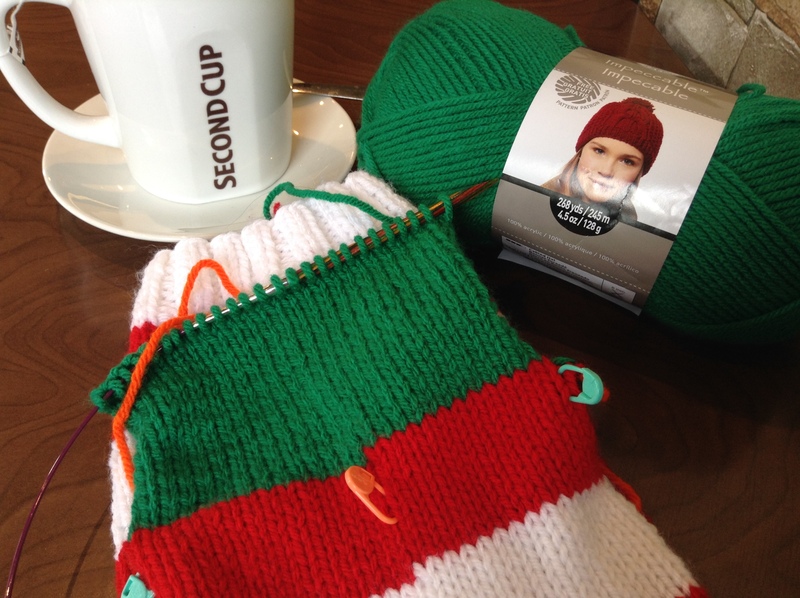 I have no intentions of knitting any more though – it’s time to get back to the crochet. November 11th tomorrow – Remembrance Day – which reminds me to continue to pray for peace. Have a great day. I had lots of opportunity to knit today. A couple of hours in a coffee shop followed by a wait at a doctor’s office meant loads of progress. I really don’t know how people can just sit around with nothing to do with their hands! The above photo includes the stocking that my friend asked me to use as a guide. I’m going to the pool tonight so probably not a lot more will get done today. I really must get to my sewing machine soon. There’s a couple of things I want to make. Unfortunately (!) I’m working the next two days. It’s been so long since I finished a knitting project that I had to go and look at my Ravelry project pages to check. I finished a cowl and a hooded cowl back in April and since then it’s all been crochet. What has inspired me to pick up the needles again, you ask!? 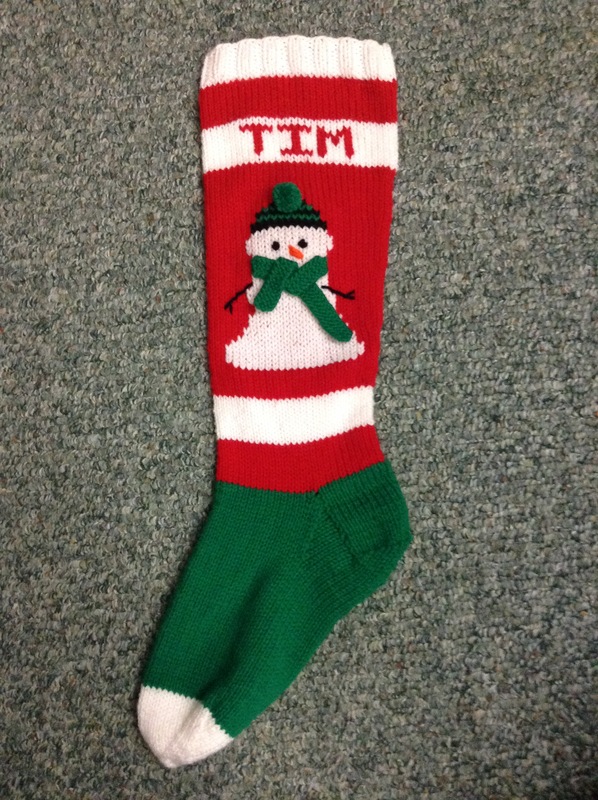 Well, a friend and her daughters have these knitted Christmas stockings, but her partner, who now lives with her and obviously will be spending Christmas with her, doesn’t have one. 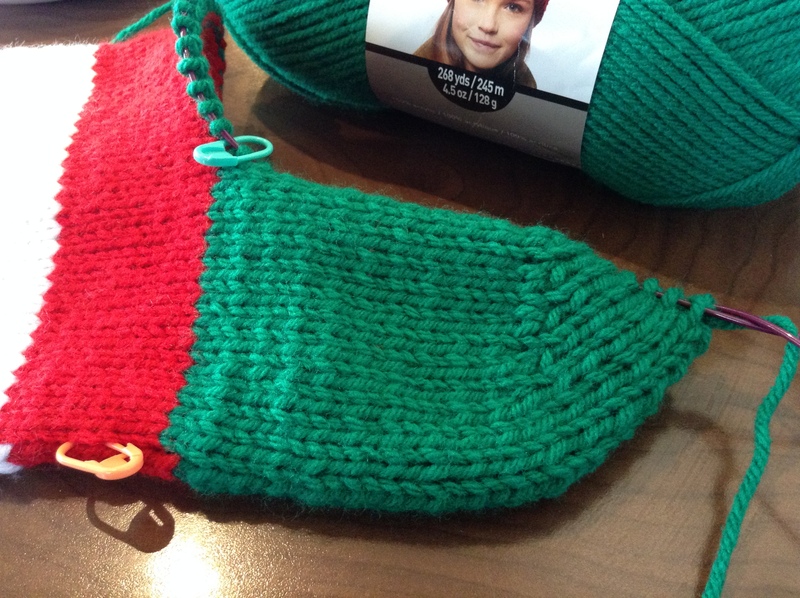 So she asked me whether I could make one for him, and I was willing to do it for the price of the yarn. 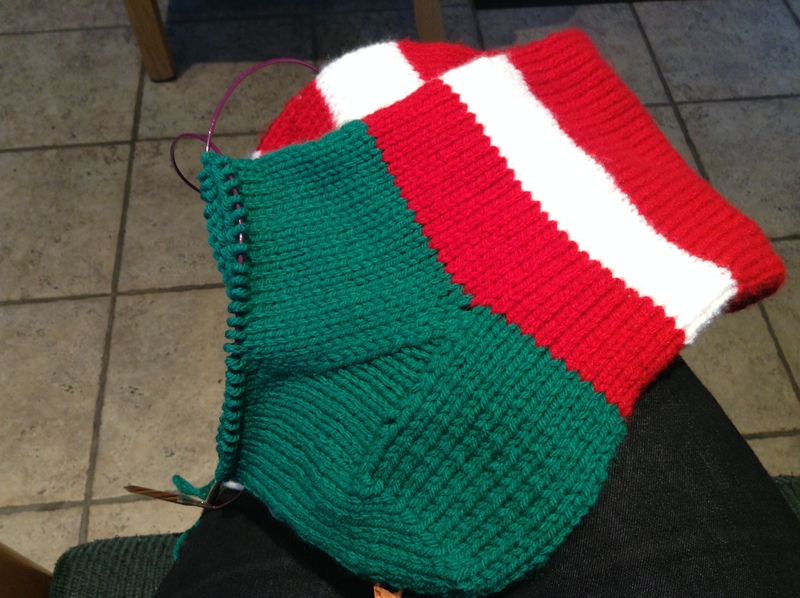 After a search on Ravelry, I concluded that the old stocking was a Mary Maxim kit, and it was a simple case of measuring the stocking and its gauge, buying some worsted yarn, and deciding on a design for the leg section. I went with a snowman. 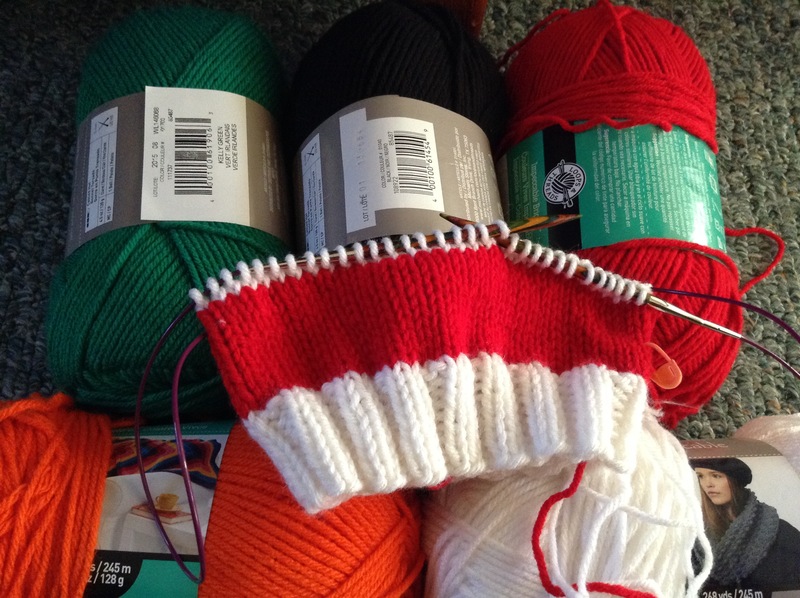 I bought yarn from Michaels (Loops & Threads Impeccable) in red, white and green (of course) plus some black and orange for features. 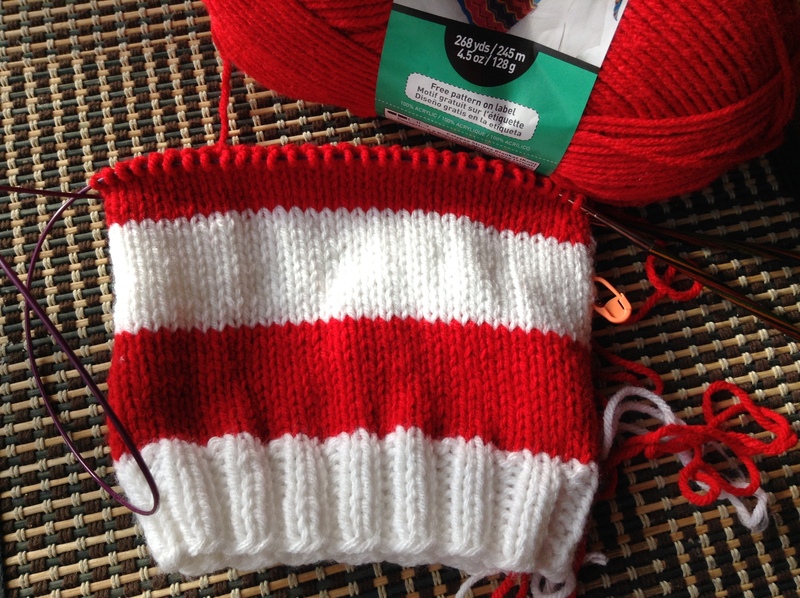 Rather than knit it flat and use intarsia for the colourwork, I have gone with knitting it in the round like a large sock and I will duplicate stitch the snowman on afterwards. My plan is for him to have a black hat and a green 3D scarf and maybe some small black buttons down the front. As of tonight I have completed 13.5″ of the leg (actually cast on for this last week). 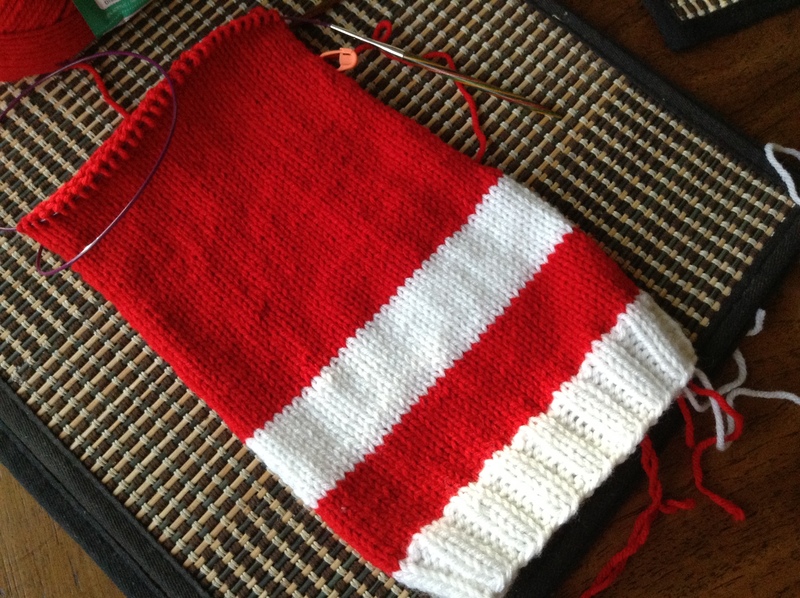 Just two of the narrower stripes to go for the leg, then I’ll make a green foot.